【 Keep Health 】- Free your hands by this Universal Tab Frame Holder! Holding a tablet with the same posture for long time can be painful, and even catch an inflammation. 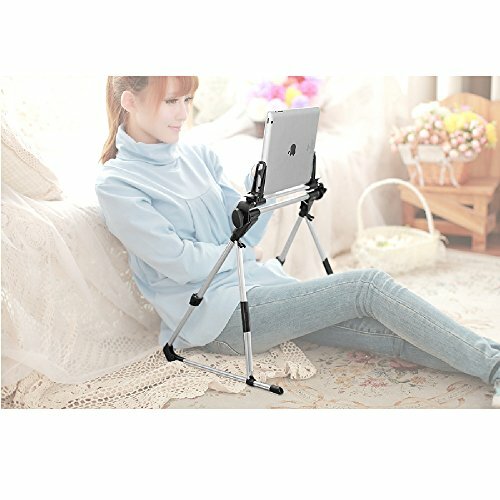 【 Multiple Scenarios 】- Adjustable Mount for most ideal and comfortable rolling viewing angle, rotating perfect visual angle for watching movies in bed, typing and reading ebook on table, playing games on floor, etc. 【 Compatibility 】- Display Holder clamp fits for tab phone e-reader that under 10.2 inches in outline dimension (NOT in screen size). 【 Great Structure 】- Triangle bracket design, providing the stability when using this mount. No need to take off devices' case. Devices' ports NOT be covered. 【 Flexibility 】- Only 380g(0.84lb), can be moved easily. Lightweight metal mobile folding design, it can be put into backpack, a huge convenience in life.